It is a well-known fact that travel can help to broaden your perspective in life, make you a wiser human being and open your heart to new possibilities. Visiting new locations, meeting new people, learning new things and being part of enriching experiences can expand your sense of self and develop an abundance of inner strength in you. However, when you combine travelling with yoga practice, it can automatically enhance the positive aspects of travelling. Whether you are a travel enthusiast or a yoga enthusiast, combining the two has been proven time and again as the best form of relaxation and unwinding. Retreat in Himalayas is a leading yoga & adventure travel retreat center in Rishikesh known for offering a great yoga and meditation experience to men and women of all ages. If you are looking to indulge yourself in adventure trips in the Himalayan Mountains and valleys, then you can consult our experts at Retreat in Himalayas who can be of service to you. We can offer guided trips in and around the Himalayan region that can completely fulfil your travel quest. It is a well-known fact that the pollution free air of Himalayas can have a positive effect on your body and mind. Yoga Retreat in Himalayas offers guests a tranquil, rejuvenating, home away from home experience. The room has its own bathroom and a porch overlooking the jungle. The bedroom has a spacious and comfortable bed. You can choose to have a private or twin shared accommodation for this retreat. Today, practice will begin from 7:00 to 8:30 a.m. with an asana class. After the 9:00 a.m. breakfast, students will be taken for a walking tour in Rishikesh local market, where they can see the colorful Indian culture, delicious Indian food, spices, clothes, ashrams, temples, and much more. Students will have lunch in the ashram, then at 5:30 p.m., they will attain a world-class Ganga ceremony in Parmarth Niketan in Rishikesh. Dinner will be at 7:00 p.m. In the morning after the yoga class, have your delicious breakfast in Rishikesh and then transfer to Kanatal. The long wooded slopes, lazy outings, cool caressing breeze warm, and hospitable inhabitants, lovely pleasant weather, and fabulous enchanting view of the snow covered mountains make it an ideal retreat for a relaxed holiday sojourn. Dhanaulti is the base point for numerous treks into the snow-capped Himalayas, especially to the Tehri region of Garhwal. The most popular treks are through the dense alpine forests that take you to Surkanda Devi, Chandrabadni, and Kunjapuri, the sacred three Shaktipeeths of the holy Devi Darshan triangle. In the morning after the yoga class, have your delicious breakfast in Kanatal and then drive to Dhanaulti Eco Park. 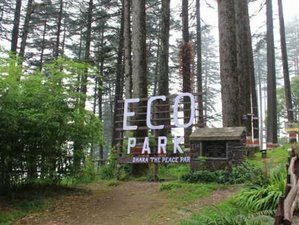 Spread over an area of 13 hectares covered in deodar and oak trees, Eco Park is one of the most visited attractions of Dhanaulti. It was developed by the DFO and the citizens of Dhanaulti to create employment opportunities for the poor people taken as a measure to reduce poverty. Located at the height of 7800 meters above the sea level, this place has enjoyable weather throughout the year. In the morning after the yoga class, have your delicious breakfast in Kanatal and then drive to Kaddu Khal, which is the base of the hike to Surkhanda Temple. From here, the hike is 2 kilometers uphill. This temple is one of the 51 Shakti Peeth located all over the Indian subcontinent and is dedicated to Goddess Surkanda - a manifestation of the feminine divine. The temple is famous for its architectural beauty and its location - perched at an altitude of 2,900 meters that offers a 360-degree view of the surrounding region along with the snowy Himalayan peaks. In the morning after the yoga class, have your delicious breakfast in Kanatal and then drive to Mussoorie. Mussoorie is a wonderful hill station in Uttarakhand situated at a height of 2005 meters above the sea level. It is situated at the foothills of the Himalayas and is known as the queen of the hills. Mussoorie derives its name from the plants of Mussoorie or shrub which are available in large quantities in this region. The history of Mussoorie dates back to 1825 when a shooting lodge was constructed jointly by Captain Young, an adventurous British military officer, and Mr. Shore, the Superintendent of Revenues at Dehradun. In the morning after the yoga class, have your delicious breakfast in MUSSOORIE and then drive to Rishikesh via Dehradun. Upon arrival in Rishikesh get served with hot Lunch. After that relax till evening. At 5.00 p.m get ready for a meditation class. Overnight stay and dinner in hotel. In the morning after the yoga class, have your delicious breakfast in Rishikesh and then go for river rafting. Rafting in the thundering rapids of the Ganges in Rishikesh is an exclusive adventure that people must undertake at least once in their lives. An adrenaline pumping activity in the midst of a breath-taking scenery of the Shivalik Hills and the Ganges, river rafting is an engrossing encounter to adore the divine beauty of nature in Rishikesh. Rafting in the holy Ganga River in Rishikesh draws adventure enthusiasts to have a taste of this exciting activity that can only be experienced at only a few places in India other than Rishikesh. In the morning, after your delicious breakfast, this adventure retreat is finished with life-changing memories. Departure time is at 12:00 p.m.
A reservation requires a deposit of 27% of the total price.